Football players is a picture, with genre photograph. Its dimensions are 2.75 in. x 4.5 in.. It was created in 1936. 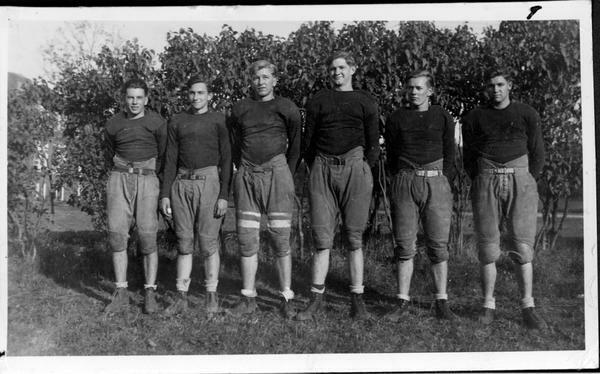 Members of Worthington High School football team are pictured. Plain jerseys were replaced with numbered jerseys by 1942. It covers the topics school sports, football and students. The Worthington Memory identification code is wsa0059. With the crisp, cool days of autumn just around the corner, it’s time to gather up your banners and seat cushions and head down to the stadium to cheer on your favorite football team: Worthington! From 1929 to 1939, the Western world was plunged into the deepest economic downturn in modern history. Our March exhibit delves into how Worthington weathered this grim decade.